Based on the acclaimed novel by Julia Leigh, The Hunter is a powerful psychological drama that tells the story of Martin (Willem Dafoe), a mercenary sent from Europe by a mysterious biotech company to the Tasmanian wilderness on a dramatic hunt for the last Tasmanian Tiger. As his dramatic hunt for the elusive Tiger goes on and he discovers the mysteries hidden within the wild landscape, long-forgotten emotions resurface. Can a human who has led an immoral life find connection and redemption too. 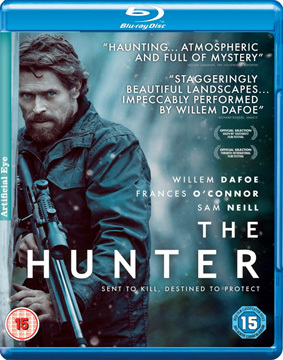 Based on the acclaimed novel by Julia Leigh and directed by newcomer Daniel Nettheim, The Hunter is a gripping and haunting blend of character study and psychological drama, featuring a trio of excellent performances from Willem Dafoe (Platoon, Antichrist), Frances O'Connor (Blessed, Mansfield Park) and Sam Neil (Jurassic Park, The Piano). Described by Jason Solomons in The Observer as a "gripping existential drama" and Mariana Antunes at Quiet Earth as "a dark and subtle tale of redemption," The Hunter will be released on UK DVD and Blu-ray on 29th October 2012 by Artificial Eye at the RRP of £15.99 for the DVD and £19.99 for the Blu-ray.